Hamilton Pool Preserve, located in Dripping Springs, about 30 miles from Austin, is a historic swimming hole where Hamilton Creek spills out over limestone outcroppings to create a 45 foot waterfall. The pool's water level stays pretty constant, even during periods of drought. If you have never visited Hamilton Pool, now is the time to go. If you've been before, you seriously need to go and re-check it out now! With all of the rain, the waterfall is amazing! Swimming under a 45 foot waterfall may just be the coolest thing to do in Austin! The swimming hole is an unusual cave with lots of green vegetation, birds and other wild life. It almost doesn't feel like Austin! It was created when the dome of an underwater river collapsed thousands of years ago and left a huge open cave, with a 45 foot waterfall that is just perfect for swimming in! When you go, take a moment to imagine the reaction of the first people who stumbled upon this amazing oasis! The cave portion is also home to an amazing number of cliff swallows that buzz in and out throughout the whole day. We even noticed one poor little bat hanging on one of the swallows nests. The swallows were not happy about his intrusion and kept buzzing him, but he held his ground and refused to move! Also at the pool is a .6 mile hike out to the Pedernales river. After you’ve enjoyed the pool for awhile, take a hike out to the river. The river area is very pretty, lots warmer than the pool with completely different landscape. Enjoy the peaceful quiet, with birds and cicadas in the background, and no other noises! We have been to this pool many, many times, both during the quiet winter and the packed summer. In the past, you had to go really early, to try and get a parking spot. But now with the new reservation required system, you know before you go whether you can get it. A little more expensive, but actually a lot more convenient! When we go, we frequently hang out at the pool for awhile. In the summer, we bring floats and tubes to cool off in. During the winter, when it is too cold to swim, we bring a picnic lunch and just enjoy the scenery and quiet. 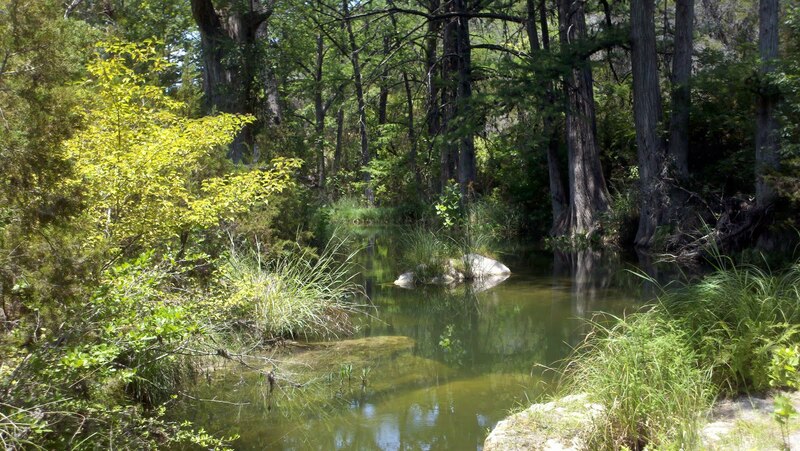 If there is time and the trail is open, it is worth the hike out to the Pedernales River. Please remember, Hamilton Pool has new rules for the summer (May 15 - Sept 30). You must first go online to their site and make a reservation. Fees are now $15 per vehicle plus am $11 reservation, bringing the total to $26 per carload. ● Call before you come. If the bacteria levels in the pool are too high, they close the pool for swimming. ● Make your reservation early, the place only has 70 reservations per day (the parking lot only has 70 parking spaces), and weekend reservations fill up weeks in advance ! ● Bring a light cooler or backpack with drinks and food (no water available on site). ● Also, bring a float or tube to hang out in. ● And the park does not allow pets; if you have one, they will turn you away!